Create a motivational learning environment to encourage students to reach their full academic potential. The 54-piece You-Nique Strut Your Stuff bulletin board set creates a positive learning environment by adding visual interest to build a focused classroom community. 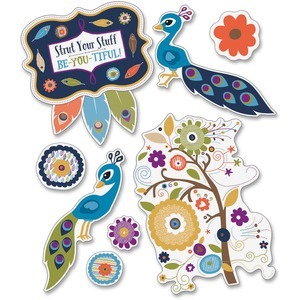 This decorative set is the perfect way to motivate students and energize your classroom. It features peacock, feather and flower accents to create a unique display that encourages individuality. It is versatile by design, allowing the pieces to be used individually or together to assemble your ideal display. With bold colors and contemporary patterns, this bulletin board set offers more than just decoration. It helps motivate your students by creating a fun, focused environment. Be sure to look for other coordinating products to create a cohesive classroom theme.